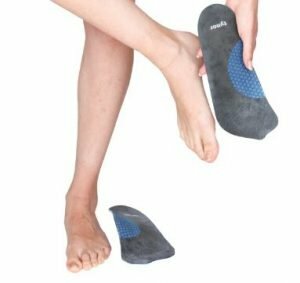 Medial Arch insole is designed to support & maintain the arch of the foot. It is designed to distribute the pressure on the foot evenly and naturally. Placed inside the shoe for effective results. Rigid support to the arch. Massage spots for the arch. Moulded design with perfect foot anatomy and arch for proper weight distribution and comfort. Honey Comb Matrix design is light in weight, provides proper contour and firm support to the arch. Made from Poly Urethane which has anti-slip, antifungal properties and long functional life. There is no cracking, breakage or deformation. Fabric lining is soft and feather-like. Improves cushioning, comfort and aesthetics. It absorbs sweat and improves compliance. Hexagonal soft spots on the fabric provide massage and proprioception, Improve aesthetics and grip. Quarter design makes it ready to wear in a regular shoe, thus Improves compliance.